Globally, number of smokers has climbed from 721 million in 1980 to 967 million in 2012, thanks to countries like India, China and Russia. 14-year-old Ravi arrived at a new college and tried to make friends by stealing cigarettes from his father. He would have never anticipated that 30 years later, the damage caused by smoking would be irreversible. During his mid-40s, the chronic cough and laryngitis turned out to be symptoms of throat cancer. However, undergoing 38 radiation treatments and spending countless hours at the doctor's office were not enough to save his larynx. He now has a stoma, or opening, on the surface of his neck that allows him to breathe and a laryngeal implant that aids him in speaking. More people smoke worldwide today than two decades back as population growth surges and cigarettes gain popularity in countries such as China, India and Russia. China had 182 million smokers in 1980, and nearly 282 million in 2012. Russia, where about one-third of people smoke, has added one million smokers since 1980. The USA has been successful in decreasing the rate of its population that smokes to around 14.9 per cent, according to the Centers for Disease Control and Prevention (CDC). India gained 35 million smokers - bringing its total to 110 million - even though the smoking rate fell from 19 to 13 per cent of the population. Globally, the number of smokers has climbed from 721 million in 1980 to 967 million in 2012 thanks to countries like India, China and Russia. Most smokers do not realise the highly addictive nature of cigarettes. In reality, the effects of smoking appear over long periods of time. Hence, it is difficult to gauge the toll it will take on one’s health and life in general. That's why the World Health Organisation calls tobacco a "gradual killer". The cultivation of tobacco itself, is a dangerous affair to one’s health. Many health scientists claim that chemical fertilisers, pesticides, herbicides, and fungicides have all been sprayed on tobacco crops for as long as they’ve been available. Many insect pests are attracted to various parts of the growing plant at different stages of the growing cycle and harvesting season. 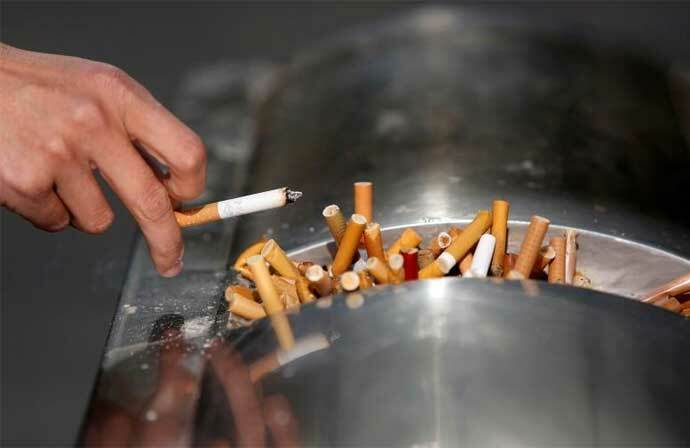 Researchers have found up to 4,000 chemicals and pesticides inside cigarettes. In addition, new studies show that up to 90 per cent of tobacco plants in the United States are being genetically modified. When inhaled through the nose, tobacco smoke passes over the area around the olfactory nerve. As the barrier between the blood and the cerebral cortex surrounding the olfactory nerve is only five cells thick (a capable barrier requires eight cells), an individual is vulnerable to many of the aerosolised chemicals being transferred into the brain. The heavy metals in tobacco smoke, once they enter the brain, will often stay there for a lifetime. Dementia, especially Alzheimer’s disease, has often been linked to lifelong smoking. A concerning question is: Why do people choose to smoke if they know of its harmful effects? Most smokers are aware of at least a handful of harms caused by smoking, yet, they still choose to smoke. What is the rationale behind their decisions? The answer lies hidden in the fact that smoking is a discretionary human behavior acquired through the operation of many well-understood psychological mechanisms. One unanimous answer is that stress plays a clear role in the maintenance of smoking behavior. Additionally, there is growing evidence that psychological distress experienced in adolescence is causally related to the onset of smoking behavior in that age group. Smoking has been an avocation that has accompanied humans through 5,000 years of the history of human evolution. The smoking of tobacco and various other hallucinogenic drugs was used to achieve trances and successful contact with the spirit world. In Ancient Greece, smoke was used as a healing practice and the Oracle of Delphi made prophecies while inhaling natural gases from a borehole. In Hinduism, the ancient Indian scripture Atharva Veda mentions cannabis. Traditionally, smoking and mind-altering drugs were celebrated for their medicinal effects, as medical sciences and technological advances on a present day scale were not available at that time. Certain herbs were significant in maintaining mental balance while also relieving physical pain, mental aches, overall ill health, severe weather conditions, and were also used for recreational purposes. Organic herb-based smoking environments warded off pains and delivered pleasures. According to one Mahayana Buddhist tradition, the Buddha, in his last six years of asceticism before enlightenment, subsisted on one cannabis seed daily. In Tantric Buddhism, this plant is taken to heighten awareness during certain rituals. In 1912, Dr Isaac Adler, American physician, was the first to strongly suggest that lung cancer is related to smoking. Prior to World War I, lung cancer was a rare disease that most physicians never saw in their career. With the rise in post-war cigarette smoking, however, the significant increase in lung cancer encouraged investigations into the link between smoking and cancer. He argued that tobacco use was associated with the fact that lung cancer struck men four or five times more often than women. At that time, the social stigma attached to smoking led to fewer women smokers. Women who smoked were considered vulnerable to premature aging and loss of physical attractiveness. Women smokers were considered unsuitable to be wives and mothers in traditional conservative families. That a smoking mother's breast milk contained nicotine, as suggested by some physicians, is a claim modern research has verified. A true groundbreaking claim came in 1948, when the British epidemiologist Richard Doll published the first major studies to prove that smoking could causes serious health challenges. Smoking has been consistently, convincingly, and causally related to a host of cardiovascular, peripheral vascular, and cerebrovascular diseases (CVD). The epidemiological support for this connection holds across genders, cultures, and active and passive smokers. Moreover, CVD risk amongst smokers decreases with smoking cessation, and well-understood pathophysiological mechanisms are available to explain the links between smoking and CVD risk. In the majority of cases, cigarette smoking originates during early to middle adolescence, but CVD manifests itself in middle or late adulthood. Despite this recognition and consequent application of a multitude of smoking prevention programs targeted at early and middle adolescents, rates of smoking behavior remain high in this crucial developmental stage. Apart from the effects of smoking on lungs, there has been a significant amount of research on the association between smoking and heart disease. According to the American Heart Association, cigarette smoking is the most important, preventable cause of premature death in the United States. It accounts for more than 4,40,000 of the more than 2.4 million annual deaths. Cigarette smokers have a higher risk of developing several chronic disorders. These disorders include fatty buildups in arteries, several types of cancer and chronic obstructive pulmonary disease (lung problems). Atherosclerosis, or buildup of fatty substances in the arteries, is the leading contributor to the high number of deaths from smoking. Many studies detail the evidence that cigarette smoking is a major cause of coronary heart disease, which leads to heart attack. Almost one-third of deaths from coronary heart disease are attributable to smoking and secondhand smoke. Smoking is linked to about 90 per cent of lung cancer cases in the United States. About 20 per cent of adult men and about 16 per cent of adult women smoke. The highest percentage of people who smoke are between the ages of 21 and 34. About 54 per cent of American children ages 3-11 are exposed to secondhand smoke. On average, smokers die more than 10 years earlier than non-smokers. There are more than 5,000 chemical components found in cigarette smoke and hundreds of them are harmful to human health, according to the Centers for Disease Control and Prevention. Carbon monoxide is a harmful gas you inhale when you smoke. Once in your lungs, it’s transferred to your bloodstream. Carbon monoxide decreases the amount of oxygen that is carried in the red blood cells. It also causes the arteries to harden. This leads to heart disease, artery disease and may result in heart attack. Nicotine is a dangerous and highly addictive chemical. It can cause an increase in blood pressure, heart rate, flow of blood to the heart and a narrowing of the arteries (vessels that carry blood). Nicotine may also contribute to the hardening of the arterial walls, which, in turn, may lead to a heart attack. This chemical can stay in your body for six to eight hours depending on how often you smoke. Smoking also causes chemical changes in your body. Cells in your bloodstream called platelets clump together when they react with toxic cigarette ingredients. This makes your blood thicker and stickier. It becomes harder for your heart to push it through your blood vessels. Cigarette smoke raises levels of LDL, or "bad" cholesterol, and a blood fat called triglycerides. Those cause waxy plaque to build up in your arteries. At the same time, it lowers HDL, or "good" cholesterol — the kind that prevents plaque from forming. Secondhand tobacco smoke contributes to about 34,000 premature heart disease deaths and 7,300 lung cancer deaths per year. Studies show that the risk of developing heart disease is about 25-30 percent higher among people exposed to environmental tobacco smoke at home or work. Second-hand smoke promotes illness, too. Children of smokers have many more respiratory infections than do children of nonsmokers. While the amount of time required varies, smokers who give up smoking have been shown to revert to coronary heart disease rates similar to nonsmokers. Cessation of smoking is the best and the only option to a healthy heart when it comes to cardiovascular diseases associated with smoking behaviors. Because smoking is extremely addictive in nature, it is a challenge to quit due to the very reasons that one starts smoking. Stress from occupation, lifestyle, financial distress, emotional imbalances, relationship issues and social environment, tortures of a modern and technologically advanced upbringing, all contribute to the habit of smoking. Do alternative smoking strategies work? Inventors have developed various ways and means to satisfy the smoker, using alternate materials or devices to support smokers in their process of retraining the brain to survive without the nicotine shot. Nicotine stimulates regions of the cortex associated with reward, pleasure and reduced anxiety. When nicotine intake stops, withdrawal symptoms include cravings for nicotine, anger/irritability, anxiety, depression, impatience, trouble sleeping, restlessness, hunger or weight gain, and difficulty concentrating. It is not clear at this time whether e-cigarette use will decrease or increase overall nicotine addiction, but the nicotine content in e-cigarettes is adequate to sustain nicotine dependence. The limited success of current smoking cessation therapies encourages research into new treatment strategies whereas mind-body practices such as yoga and meditation have the potential to aid smoking cessation and become an alternative drug-free treatment option. Current primary treatments for smoking cessation, including cognitive and behavioral therapies, as well as pharmacological treatments including nicotine replacement therapies and atypical antidepressants, have moderate effects on the quitting process. In view of this fact, the results of the research review on the effects of yoga and meditation in smoking cessation are encouraging. While traditional smoking cessation treatments help many to quit smoking in the short term, long-term abstinence poses a considerable challenge for most tobacco users. Including complementary therapies like yoga and mindfulness practices as part of smoking cessation programs may help to increase mind-body awareness, and to cultivate greater emotional control and behavioral restraint, particularly during the stressful process of dealing with cravings and desire. Smokers trying to quit encounter many challenges including nicotine withdrawal symptoms, cigarette craving, increased stress and negative mood and concerns regarding weight gain. These phenomena make it difficult to successfully quit smoking. Studies in non-smoking populations show that yoga reduces stress and negative mood and improves weight control. By increasing mindfulness we anticipate that yoga may also improve smokers' ability to cope with the negative symptoms associated with quitting. Yoga may also improve cognitive deliberations which is needed to make effective choices and avoid smoking in tempting situations. A pilot study examines the feasibility and initial efficacy of yoga as a complementary therapy for smoking cessation. Fifty-five women were given eight-week group-based cognitive behavioral therapy for smoking cessation and were randomized to a twice-weekly program of Vinyasa yoga or a general health and wellness program (contact control). At the end of treatment, women in the yoga group had a greater seven-day point-prevalence abstinence rate than controls. Women participating in the yoga program also showed reduced anxiety and improvements in perceived health and well-being when compared with controls. Yoga is an alternative to standard aerobic exercise (like walking, cycling) and may have potential as a complementary treatment for smoking. Yoga contains two components shown to enhance affect and stress reduction: asana (yoga postures) and pranayama (breathing exercises). While yoga is associated with health benefits similar to standard exercise, yoga practice also aims to create a calm state of mind through a combination of physical postures, breathing techniques, and directed meditative/mindfulness focus. A study known as "The Breath Easy" was designed to test the efficacy of Iyengar yoga as a complementary therapy for smoking cessation using a randomized, controlled 2-group study design. This is the first randomized controlled trial (RCT) to study yoga as a complementary treatment for smoking cessation. This study design pairs both yoga and control conditions with smoking cessation counseling based on cognitive-behavioral therapy, a well-tested, effective intervention for tobacco cessation. All of the above research studies undoubtedly suggest that certain techniques of yoga and meditation practices involving breath techniques may offer both behavioral and psychological benefits that may be especially valuable for smokers who are attempting to quit. Researches on efficacies of alternative treatment therapies have provided a valuable blueprint for wider implementation of yoga programs as a complementary treatment for smoking cessation, and offered more evidence-based options for individuals who are attempting to quit smoking. The ancient wisdom definitely has a robust role in bringing success in achieving a smoke-free life.